The facts state that the average golfer has 65% of shots within 125 yards / 114,3 metres. 45% of all shots (non-putts) are with a wedge. A vital aspect of saving shots and bailing you out of trouble, last week being lucky enough to be invited for a wedge fitting with Riaan Spangenberg (The Srixon / Cleveland Tour Guy who certainly knows his stuff). Riaan showing off some great product with 2 exciting wedge products in the market namely the RTX-3 wedge range and the “wedge analyser” app. The reality is that there are many golfers have not been for a proper club fitment. With today’s technology, a sad scenario to not be getting the most out of your clubs. The analogy I have is the off the shelf black suit from any established retailer. Yes, it is a fine suit but you would look significantly better if you took it to “Juan”, your magician of a local tailor. You can walk around in the wrong fitting baggy or tight suit if you want but you just might be holding yourself back. Back to wedges and with Cleveland Golf we have no excuse with their “Wedge Analyzer” you just might be doing your short game one very big favour. Download the “Wedge Analyser” App and attach the Swingbyte 2 sensor. Hit a variety of chip shots to measure the metrics. The wedges in mind are the RTX-3 from Cleveland , incredible wedge tech in this day and age. See here: www.golfweather.com/golf-news/revolutionary-is-the-new-rtx-3-wedge-range/1601. 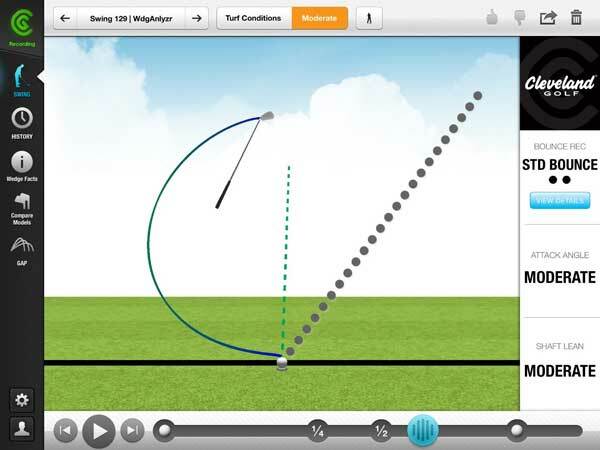 What the App looks like through one of my demo swings. Looking on the right-hand side my attack angle and shaft lean are moderate and a Standard bounce is the best choice for my swing. You can see (below) the blue line is my upswing and the green is my downswing. Even picking up an ugly little habit of going over the top (looping). Riaan and the swing analyser spotted that very quickly and an efficient teaching aid its own right. Always thinking I had a steep angle of attack, funnily comment that when I said that to Riaan he replied: “Yes mate, everyone thinks that until they see this”. In my mind always using a low bounce or 1 dot from another manufacturer. A proper, calibrated fitment has me on 2 dot or standard bounce, the first change getting the correct bounce. After a few shots and shot types, the swing metrics are all collaborated and sorted. Add in what you are currently using in terms of irons. Finding and pulling the Pitching Wedge loft is from the Cleveland Golf database that has every club manufacturer and iron from the past 2 years. If you not sure (older set) you can always check on a loft and lie machine in most golf stores. With this stronger more consistent wedge set and formation, I will have better distance and control from that crucial 1oo odd metres out. 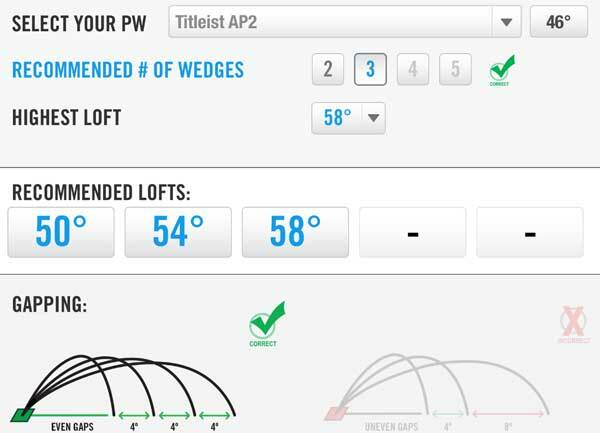 I now go PW 46° to a 50° Gap Wedge / 54 ° Sand Wedge and 58 ° as my lob wedge. In addition to finding the correct bounce for my style of play the “Wedge Analyser” also found out the correct loft/s and wedge formation. I highly recommend that any golfer who is unsure of his / her wedges should book a session with a Cleveland rep. A highly educational, exceedingly recommended and very worthwhile investment for your short game this festive season. Where can you use the Wedge Analyzer? Fitting with the Cleveland Rep in your area.